The month of August in Kosovo is known as the start of the two most anticipated events in Kosovo: DOKUFEST the biggest Documentary and Short Film Festival, and DOKU.TECH the biggest tech conference in Kosovo. DOKU.TECH challenges the social implications of technological innovations through connectivity, content, openness, and security. 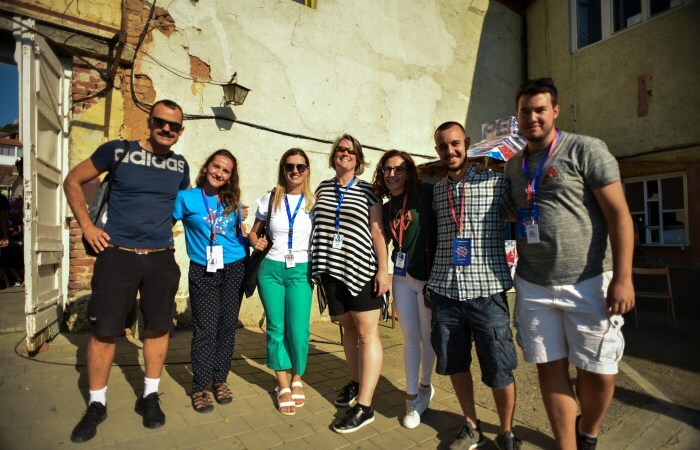 The latest edition held on August 4th at Lumbardhi Cinema in Prizren complemented perfectly the goal of DOKU.TECH with this year’s theme of “Flip the Script”. The fifth edition of DOKU.TECH brought to its mother festival DOKUFEST a diverse selection of perspective flippers; people from all over the world who are making real changes at the intersections of technology and society, culture, media, and economy. All because of their ability to see things differently! The program featured a variety of speakers coming from different parts of the world including innovators and change-makers from Spain, Portugal, and Kosovo. Luis Miguel Samperio, Benjamin Tirone Nunes, Flutura Sadiku, Dren Imeraj and Valmir Hoxha challenged us to think differently, and embrace differences. The topics differed from VR- Virtual Reality as a mean of sharing emotions, using the power of music to reach people’s emotions, building robots from peoples scrap and as far as using pizza boxes as a material to build planes. What enriched DOKU.TECH’s program this year was the D.I.Y. fair where the participants had the chance to do hands-on activities, play games, experience virtual reality, remote-control robots, and how technology & innovation can come to the aid of our environment. Such activities remind you how important technological advancement is and how you can have fun through it all. This DOKU.TECH was a call to get out of our comfort zones and explore a different perspective. Our sponsors: Ministria e Kulturës, Rinisë dhe Sportit, U.S. Embassy Pristina, Kosovo, USAID Empower Private Sector, Western Balkans Fund, OSCE Mission in Kosovo, PEN – Peer Educators Network, UNICEF Innovations Lab Kosovo, Enhancing Youth Employment- EYE Project, UN Kosovo Team, UNFPA Kosovo, UN Women Kosovo, Fondacioni Une E Du Kosoven. Our Partners: UBT – Higher Education Institution, BONEVET Prishtina, Zombie Soup, Shkolla Digjitale, Te Pema.